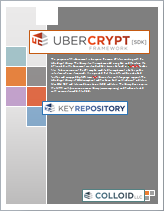 The UberCrypt SDK (Software Development Kit) is a rich set of APIs (Application Programming Interfaces) that enable ISVs (Independent Software Vendors) to secure and enhance their own applications using the UberCrypt Framework. Encrypt/Decrypt streams of data sequentially. This API is useful for all streaming data applications as well as cloud/web services applications. Encrypt/Decrypt files. 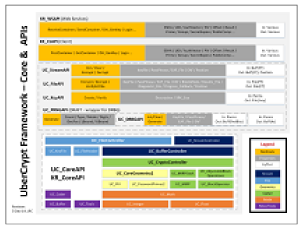 This API is useful in data-at-rest applications. Create/Verify Ubercrypt key files. A variety of controls are provided to set key strength and verify key integrity. Pseudo-random number generator to generate primes, integers, floats and RSA pairs. As well as the entire library of objects. To request a briefing on the SDK or to obtain access to the library itself, please complete the following request form.